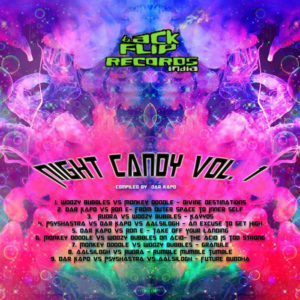 Backflip Records proudly presents Night Candy Vol. 1, the first in a continuing series compiled by Dar Kapo. Night Candy Vol. 1 showcases eight collaborative tracks with the signature Backflip Records sound of groovy and heavy style of hard kicks and rolling bass lines. Be ready to stomp the night away with your digital dose of dark pounding psychedelic sounds from New Delhi, India! All tracks written, mixed and mastered at The Loop Studio. Artwork by HAshiSH. MP3 Download | FLAC Download | WAV Download · Download count: 7,851. Seen a few good releases from these guys specially the Psyshastras albums.. Thumbs Up!! That there is some of the best track endings I’ve heard in a long time! TRACK 4 YOU BEAUTY! 9/10 for the album and two thumbs up! great chapter of dark groovy psychedelic from the rudra and apo . really deep , and trippy sounds . good to see people following original sounds .. I would love to hear this at night in a festival. Holding a cup of catuaba, smoking some hash and dancing under UV lights and a starry sky. Woooow! Track 6 the best ! !